China is joining the life-size female robot race with their version of the beautiful receptionist. 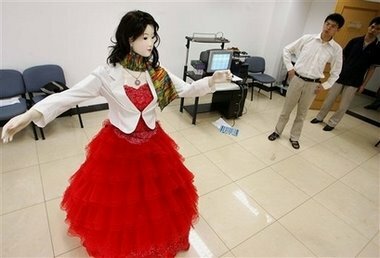 From Li Chengrong and others at the Chinese Academy of Sciences (CAS) Institute of Automation comes a Chinese "beauty." Li said the cost for designing and making the first robot was 300,000 yuan (US $37,500). However, they plan to start selling the robots next year and the cost would drop to 100,000 yuan if they can sell 100 per year. Potential customers would include star-rated hotels and entertainment clubs. This robot is interactive and can understand and speak in a Sichuan dialect for her new job as a tour guide at Sichuan Science Museum.